The Daejeon Section is part of Region 10 and will have representation at the Korea Council. The Section was formed on 17 June 1991. 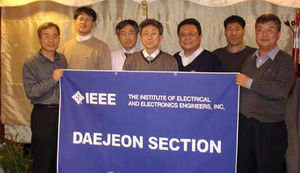 The IEEE Daejeon Section has been making the second largest Section in Korea over a number of decades since its foundation. The Daejeon Section has been accelerating many accomplishments such as hosting and sponsoring technical conferences and encouraging student activities. As of 2007, the Daejeon Section has over 1200 members. The fact that 60% of them are the student members shows that the possibility of increase not only in member numbers but also in exuberant activities. Late 1970's, as Daedeok Science Town formed to occupy many nationwide research centers at the northern part of Daejeon city, the number of scientists and researchers has increased dramatically, especially in the area of electronics and information technology. This helped the Daejeon Section accelerate its activities between universities and research institutes. Recently, the 8th and 9th International Conference of Advanced Communication Technology (ICACT 2006 and 2007), together with the technical sponsorship of IEEE Daejeon Section, were held so successfully at Phoenix Park, Korea on February 20-22, 2006, and on February 12-14, 2007 individually. The ICACT 2006 consisted of 79 technical sessions with 442 papers from 27 countries and an invited session, where 427 participants joined. The ICACT 2007 provided 426 participants with 70 technical sessions of 432 papers from 26 countries and an invited session with remarkable world experts. In 2008, the Daejeon Section will co-sponsor IEEK (Institute of Electronics Engineers of Korea) Daejeon Branch Conference and will give the IEEE Daejeon Section Best Student Paper Awards. For the aim of helping students be familiar with IEEE and give more chance of activities relating to the spirit of the Institute, the Daejeon Section founded 5 Student Branches at the major universities within the area of Daejeon city and Chung-Nam province. As of 2008, the Daejeon Section has Student Branches at Chungnam National University, Kongju National University, Hanbat National University, ICU(Information & Communications University), and KAIST(Korea Advanced Institute of Science and Technology). This page was last edited on 14 August 2017, at 17:43.